Terry has a beautiful smile and soft, empathetic eyes. She can be found at a park in Fullerton feeding the squirrels and caring for a stray cat. She sleeps at that very park not too far from where she grew up. There were a few other homeless people there, but she was the only woman. While the men congregated together, she kept some distance from them. She’s been living on the streets for more than 2 years now. She doesn’t panhandle or beg for money. She gets by only on the change she finds on the ground. She will stay at the local shelter when it’s open for six months out of the year, then she’s on her own. At those times it’s safer for her to sleep during the day, and stay up at night. In the evening, she will sit at a McDonald’s sipping some coffee until they close, then she makes sure to stay at well lit areas for the rest of the night. We sat and chatted under a tree at the park. I offered to give her some extra clothes, blankets, shoes, but she politely declined as she preferred to pack light. 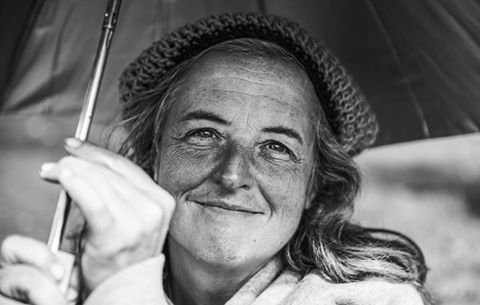 She did gratefully accept a hand made beanie that my friend made and an umbrella another friend donated to me. We chatted for some time, sharing life stories, having a good laugh, and just enjoying the beautiful day together. As I got up to go, she gave me a big hug, and I realized that companionship and a good conversation was what she appreciated the most. In spite of hardship, she faces each day with a smile.